Kathmandu surprises and excites the traveller at every turn. Just being there is an experience, but take it one step further with this travel guide on fun things to do in Kathmandu! Accompanied by a hypnotising smell of incense sticks, mixed with dust and hot air, and the even more attractive smell of street food, Kathmandu is a fascinating city to explore. The very definition of organised chaos, there's colour and movement everywhere. If it's your first time to an Asian city, you might need to brace yourself! More frequent travellers to Asia consider it to be something of an India-lite. This sightseeing guide on the best places to visit in Kathmandu is not supposed to be a checklist that you have to tick your way through. Instead, it's a suggestion of fun things you can pick and choose from depending on how long you want to stay in Kathmandu. For information on visiting Nepal for the first time, check out my first timers guide to Nepal. How long should I spend in Kathmandu? Kathmandu is a fun and exciting city, but I'm not going to lie to you, it's also very polluted. The face masks that people choose to wear are not for decoration – there are some serious air quality issues in Kathmandu. As such, I would say that 2 days in Kathmandu is enough for most people. 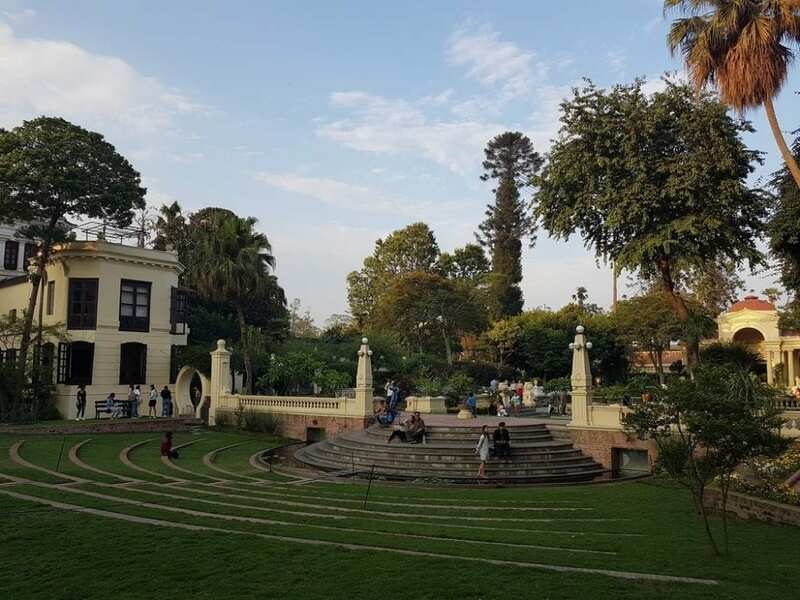 Those that stay longer probably do so in the more luxury hotels in Kathmandu, which are situated away from the centre and have their own green spaces. Besides which, most people use Kathmandu as a transit point. They fly into the city, spend a couple of days there, and then head out for trekking or other activities. So, 2 days in Kathmandu in the beginning, followed by maybe another day or 2 at the end of your time in Nepal is going to be enough for most people. Really, just wandering aimlessly around Kathmandu is fun! To get a more rounded experience of Kathmandu though, you may want to include a few of these suggestions in your Nepal itinerary. 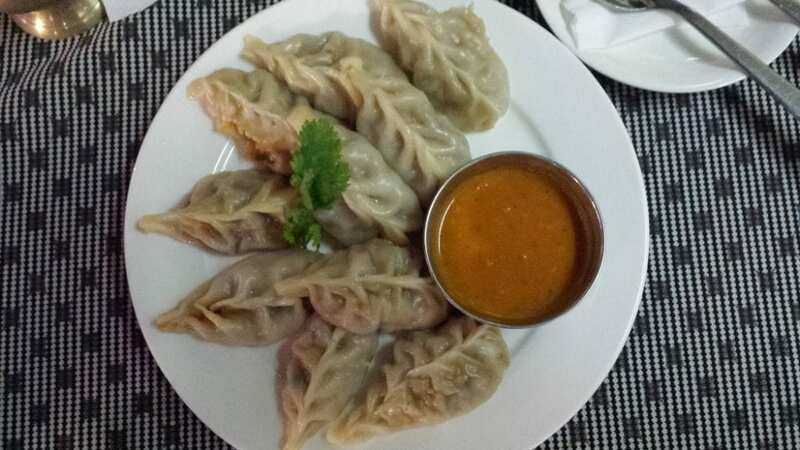 Dive straight into the tasty Nepali cuisine, and begin your quest for the best momos in Kathmandu! For the uninitiated, momos are a steamed (or fried) dumpling found throughout the Himalayan region. Inside the momos, you might find vegetable, chicken, chilli, and other fillings. Outside, they are neatly hand-wrapped and are served with a sauce…normally spicy! If you haven't had at least one serving of momos a day when visiting Kathmandu, you haven't really lived. You'll be able to get momos in Kathmandu everywhere, from your hotel, to street corners. If you've got any recommendations on where to find the best momos in Kathmandu, please leave a comment below. I'll check them out the next time I visit the city! Perhaps the most well known of the tourist places in Kathmandu, Thamel is a commercial neighbourhood which also has a number of accommodation options for a range of budgets. 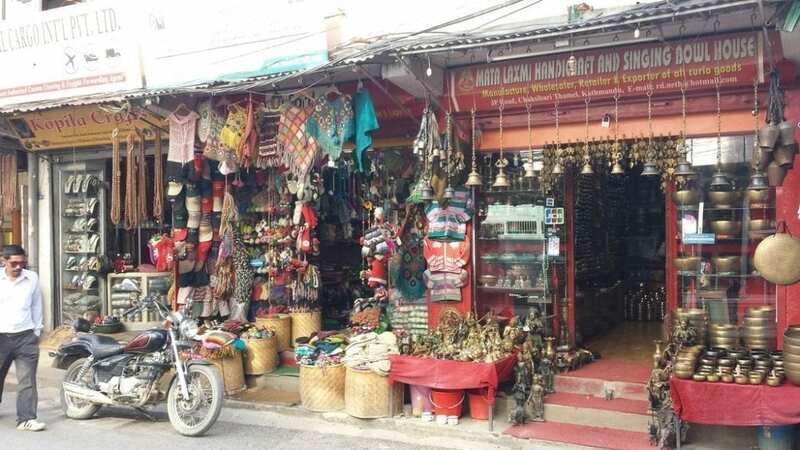 Thamel is a perfect place for those looking for natural fabrics and clothes, colourful accessories and jewellery, pieces of art and unusual but very Nepalese souvenirs. Bargaining is essential here! It's also where visitors to Nepal can stock up on cheap ‘North Fake' clothes and accessories. Remember, for the most part you get what you pay for! I've noticed that Thamel in Kathmandu has changed over the last couple of years. Gone are the dusty, mud roads to be replaced by some sealed roads. A pedestrianised area, that is planned to be expanded, means that you don't need to be quite aware for traffic any more. I'd say it's taken its chaos level down from a 9 out of 10 to a 7. 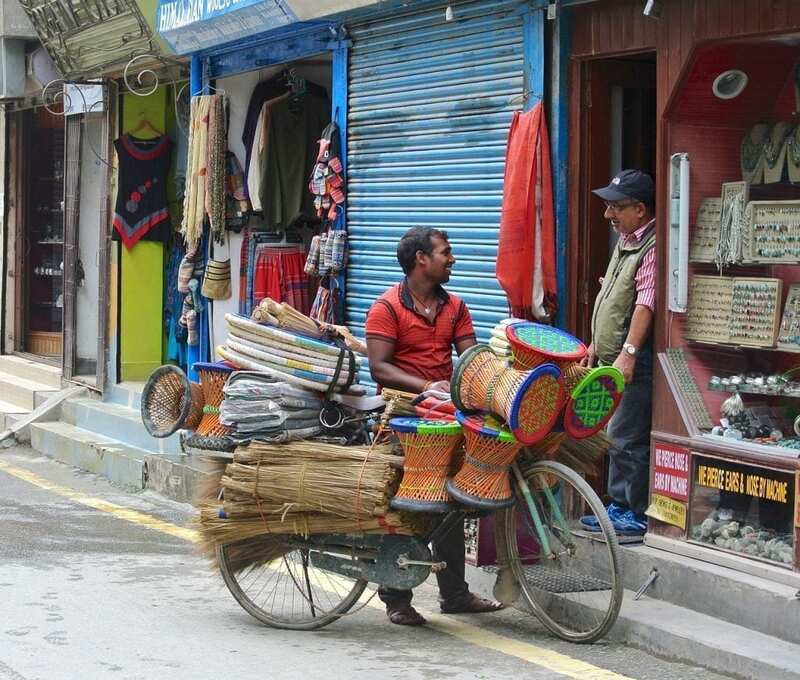 When exploring Thamel, you'll likely see a few bicycle rickshaws cycling up and down the streets. If you've never been on a bike rickshaw before, now's your chance! Remember that whilst bargaining is part of the culture here, don't go too hard on these guys. Do your fellow human being a favour – it might make their day, week, or even month. A bike rickshaw is a great way to check out the more central things to see in Kathmandu. The old town is one of the best places to visit in Kathmandu. It holds the true spirit of the city- comprised of Hindu and Buddhist temples, royal mansions, and narrow streets that take you to unexpected places – it tells a story that is felt and experienced rather than simply observed. Look for Hanuman Dhoka, a royal palace built between 4th and 8th centuries AD; then check Durbar Square, a place where royal family lived until 19th century. Make sure not to miss Itum Bahal, the largest Buddhist monastery courtyard that would take you back to 14th century tranquil routine. If only there was an area in the centre of Kathmandu where you could get away from it all. An oasis. A garden. Well, there is! The Garden of Dreams is modelled as a neo-classical garden, and was built in 1920. If you're looking for a serene location to relax right in the eye of the storm that is Kathmandu, then the Garden of Dreams is for you. An entrance fee applies. There are also a number of day trips from Kathmandu that you can take. Each one of these is worthy of your consideration, depending on your interests. Located in the Kathmandu Valley outside of the city centre itself, Swayambhunath is one of the oldest religious sites in Nepal. It is an important place for Buddhists and Hindus alike, and each morning before dawn hundreds of devotees of both religions (and no doubt a few tourists) ascend the steps before beginning to walk around the stupa in a clockwise direction. 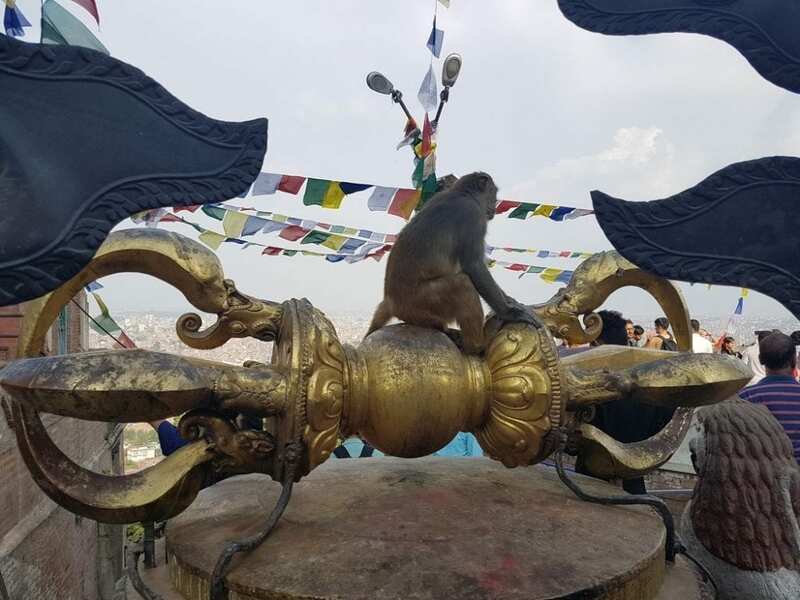 What makes Swayambhunath one of the fun things to do in Kathmandu for visitors is the monkeys. In fact, it is also known as the monkey temple, with various troops roaming free throughout the complex. They have no fear either. Take a snack out of your pocket, and they will soon rip it from your hands! 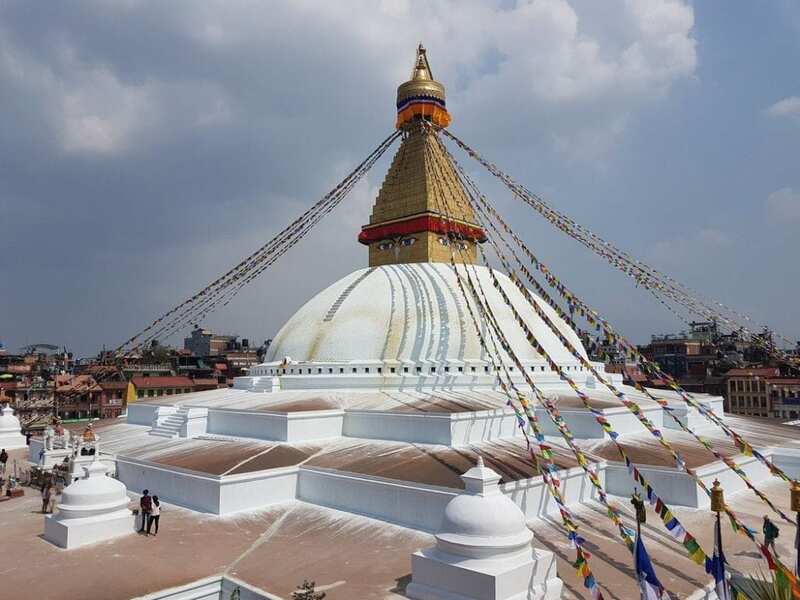 One of the largest stupas in the world, Boudhanath Stupa is located about 11km from the centre of Kathmandu. In 1979, it was classified as a UNESCO World Heritage Site. 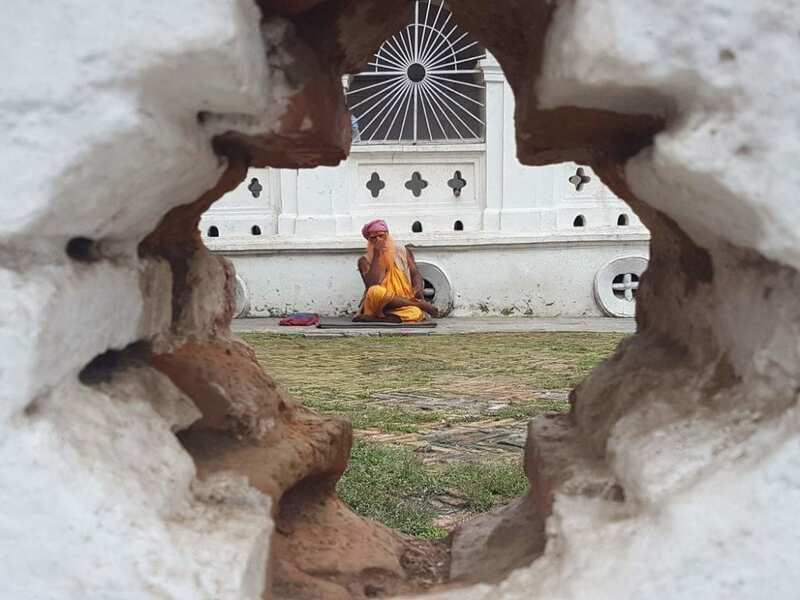 Visitors here will see devotees performing penance around the perimeter, as well as tourists from Nepal, India and other countries wandering around. There are a few nice restaurants (some with tourists prices!) scattered around the edges of the square. You can reach here by taxi, bus, or tour. I never got the chance to visit here myself when staying in Kathmandu, but next time, this place is number one on my list. Just because it's called Whoopie Land! 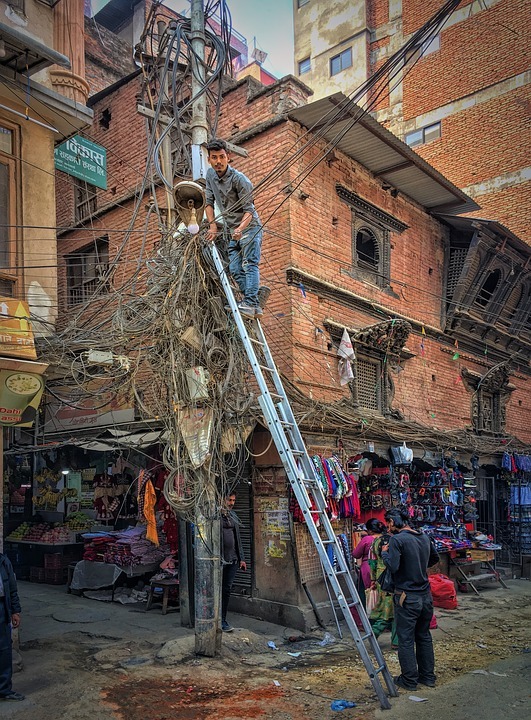 It could be fun if it looks like you will be stuck in Kathmandu for a few days waiting for flights to Lukla, or even if visiting Kathmandu with kids. A video of Whoopie Land in Kathmandu below. 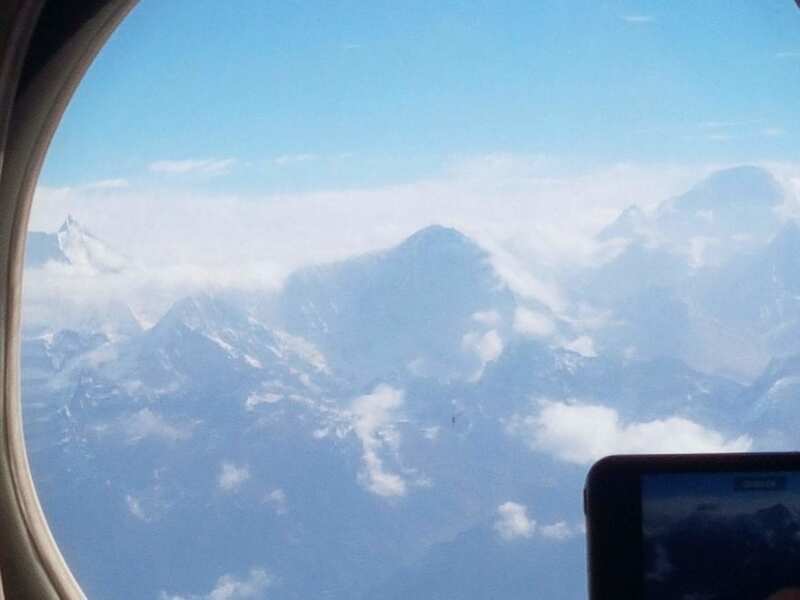 Many people who might not otherwise be able to see Everest choose to take the Everest flight. This 45 minute flight takes you out from Kathmandu, and over the Himalayas for views of Everest. Now, I'll be honest with you here, nothing is guaranteed. I thought the views were ok, but didn't really end up with any nice photos on my phone from the Everest flight. Other people on the same plane ended up with better ones. It all comes down to where you sit, clouds, light, if your window is dirty and other factors. If you want to find out more though, take a look here for the Everest flight tour from Kathmandu. I took this popular day trip from Kathmandu when I first visited Nepal in 2017. 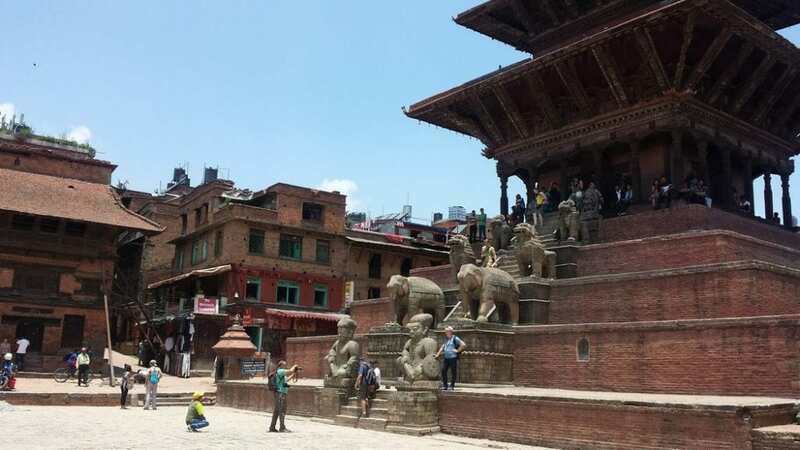 This was almost two years after the devastating 2015 earthquake, which damaged many of the buildings in the UNESCO World heritage site of Bhaktapur Durbar Square. The key places to visit on a day trip to Bhaktapur from Kathmandu are Nyatapola Temple, 55 Windows Palace, Vatsala Temple, Golden Gate, and Mini Pashupati Temple among others. You can reach Bhaktapur by taxi from central Kathmandu, as it's only 18kms away from Thamel, although you'll need your haggling skills to be up to standard! There are also buses, and guided tours to Bhaktapur available. Nothing can be more authentic than a village, a village in Nepal – even better. Head to Bungmati and Khokana, villages that date back to the 6th century and represent the Nepalese culture raw and untroubled by the city rush. Enjoy the greenery, try locally grown foods, meditate, give yourself up to a wood carving or sculpture class. 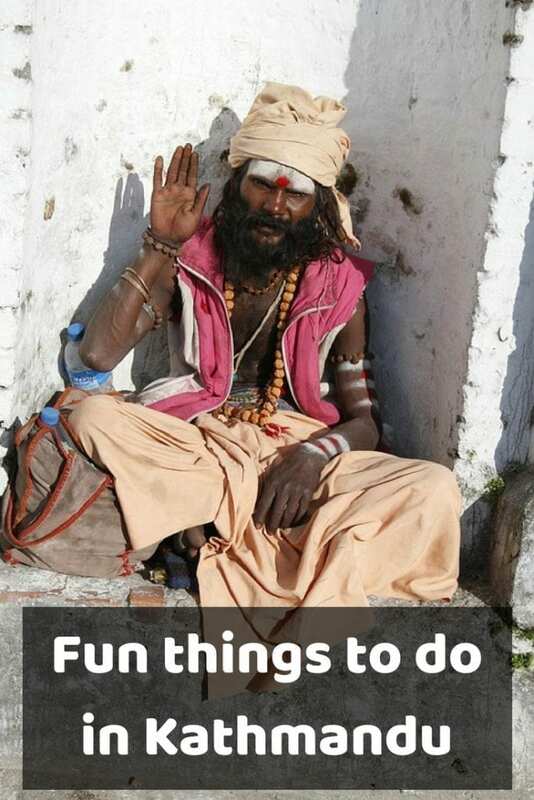 Please pin these fun things to do in Kathmandu for later!